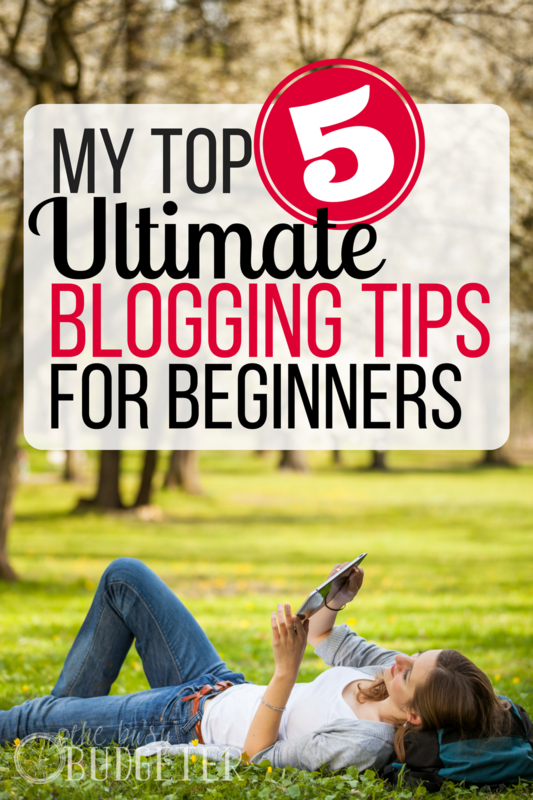 These ultimate blogging tips for beginners will offer insight and give you direction to help your blog grow. I believe that if you can find a way to work from home, then you can change your life. Working from home provides a way for you to manage your time so that you can be with your family, research and go after your passions, and find ways to make new income streams. You won’t have to show up to work and leave when your manager tells you to leave. You can create your own schedule that works around what you want to do. And that’s what working from home did for me. Of course I had to work hard at first, but after a couple of months, I was able to have more flexibility to pursue dreams such as traveling full-time with my husband. Now my husband and I had wanted to find a way to work from home even before we got married in early 2015. He had worked horrible corporate jobs for a couple years and the best I could do was a part-time job because I lacked a college degree. We listened to podcasts and read countless articles on ways to work from home, but nothing seemed to fit until I listened to an episode from The Side Hustle Show podcast. They were interviewing Rosemarie about her blogging success. Now mind you, I had never wanted to blog. 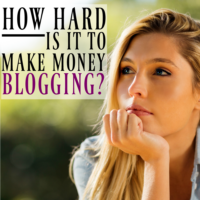 Every time I read about blogging, everyone said that it would take years to gain real success and start making a good income.. and I was not up for that. But Rosemarie made blogging success sound so achievable. She gave real actionable advice when it came to Pinterest, and I instantly knew I could do it too. So after several months of blogging and being able to get my husband out of the corporate world, I’ve found exactly what works for me. And below I give you some of my top blogging tips that helped me get where I am today. I hope that this advice can help you out on your blogging journey too! Pain points are the problems that people want fixed now, and you have to know how to hit them. They don’t want to know about you and your dog’s relationship, they want to know how they can lose 5 pounds in a week for their sister’s wedding. They want to know how they can cut out $2,000 from their monthly budget because they’re living paycheck to paycheck. Another way to put this is WIIFM which means, “What’s In It For Me.” You have to act like everyone has this written on their foreheads. People want to know how this blog post is going to make a big or small change in their life. So every time you write a post, make sure you have WIIFM in mind. One of the biggest mistakes I see people make when they first start out blogging (and of course I made this mistake at first too), is assuming that people want to know about their personal life. I also see them give vague titles to their blog that doesn’t tell the reader in any way how this will benefit them, or they write on a subject that only a small amount of people will care about. If you want to have blogging success, you can’t do this. It’s ok to write more personal posts about your life, but don’t market it on social media; it’ll just waste your time. Or just save them for when you’re more established and have a great following. 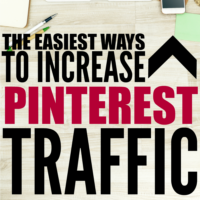 One of the best tricks that I’ve learned when it comes to promoting your posts on Pinterest is to make multiple pins for every post. It sounds like a lot of work, but it honestly doesn’t have to take very long. Make a list of 4-5 titles that grab the reader’s attention and create a sense of urgency and/or curiosity. Then, once you create your pin image, you can simply put the different titles onto the picture and save each one. You can do this whether you’re just using one image or more. You have NO IDEA how many times I thought one of the pins in the group of 4-5 images wouldn’t do well and it ends up doing the best. Last Note on Multiple Image Testings: I’ve found that if one pin in the group of images that’s linked to the same url goes viral, the rest will do extremely well too. Just so ya know! Now one of the biggest questions I get from people who want to start a blog is, “What if I have nothing to write about.” Many people have the same interests such as DIY, recipes, finances, and/or family, and they all let me know that they’re afraid that no one will read their content because there are so many other people out there that blog about the same niche. And each time, I answer them with the same thing; add value where those other bloggers don’t. If this is a fear of yours, then one of the best things you can do is to find the top bloggers who are writing the same subjects you want to blog about and see what they’re putting out there. Then, once you find a project or an idea you could replicate, add value where they don’t. Go into more depth on the subject and prove to new readers why you should be their go-to for DIY or financial issues. If you’re just starting out as new blogger, this can prove extremely helpful. So when my husband was working a soul sucking corporate job and we kept on having bills pop up and the car breaking down, it was pretty tempting for me to go out and get a part-time minimum wage job (Remember? I don’t have a college degree) to ease the tension and money stresses. But we chose not to. 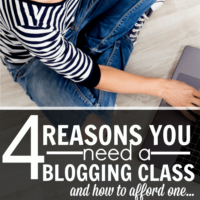 I believe opportunity cost is one of the the biggest things you need to remind yourself of when blogging. People want to say that the work you put in before your blog takes off is worthless, but I couldn’t disagree more. 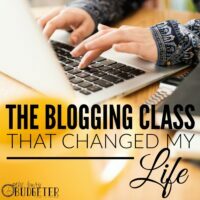 The time and energy you put into creating content and a firm foundation for success is paid back to you in HUGE dividends once your blog gains recognition. So don’t feel discouraged when first starting out, you’ll be able to pay yourself back any money and time invested multiple times over. Lastly, just remember that in a year from now, you’ll wish you started today. This is something my husband always reminded me of. So where do you want to be in a year from now? Would you rather be surfing Facebook or watching Netflix after a hard day of work at a dead end job, or would you rather be bringing in a new income stream and working from home? You may think that you deserve to relax after working so hard at your job, but what you really deserve is to work hard now so that you can have time and financial freedom later. Grace Moser is a full-time traveler and blogger who loves to help others gain freedom from the 9-5 so they can go after their passions. She's seen how many doors have opened for her and wants to give people the same type of opportunities. She and her husband got out of the corporate world within a matter of months of starting her blog that she wanted to show others that they can do it too. You can find Grace at Chasing Foxes.com. Great tips once again.I’m keeping these into my evernote so I can review them again. I always get something so useful from here that it alters my course of action for the better. I recently purchased the domain http://www.mendingwithgold.com after all the motivation I got from Rosemarie and she’s been so kind she reviewed my name at a time when I was freaking out and so nervous. She gave me the buck up and a green flag! She also made me look like I’m super cool. After reading so much info out there which had been nauseatingly ummbobligating (?) , I have decided I’ll stick to blogging guidelines coming from here ONLY for now. Once I’m done with THESE steps, then only will I decide to buy some premium blogging stuff or go elsewhere too. I’ve given myself one month to at least start off with implementing all blogging info from here… super excited tp see some more useful tips. Thanks Grace. Thank you for your kind words! I’m so glad I was able to help you. Awesome tips! I blog around a full-time job and it can be exhausting, but what you said about starting today is true. I don’t want to miss an opportunity by focusing on excuses. There’s a Chinese Proverb that says “the best time to plant a tree was 20 years ago, the second best time is now.” No better time to plant a new blog than now :] Thanks for sharing these tips! Hey Misty! I love that proverb! It’s so true. I used to be on Facebook and Youtube all the time, but as soon as I cut those out, my blog took off fast and excelled at a rate it wouldn’t have if I had kept social media around. Nice article. It’s good for beginners who wants to start a blog. Thanks for sharing the informative article. I’m wondering if you’d be willing to take the time to check out my blog. I just started yesterday and only have an About Me page. No posts yet. I’ve been following your suggestions on starting a blog and I’d like your honest opinion on my About Me. Thank you in advance! Oops… Wrote my email incorrectly below. Haha!